CentrikBlogsBusiness AdvisoryRERA ConsultingCan home-buyers remove the builder from the project? Since the implementation of the Real Estate (Regulation and Development) Act, 2016, the home-buyers now knocks the door of RERA to get the legal recourse but it has been noticed that the RERA Authorities have received majority of the complaints related to the delay in possession of the project only. 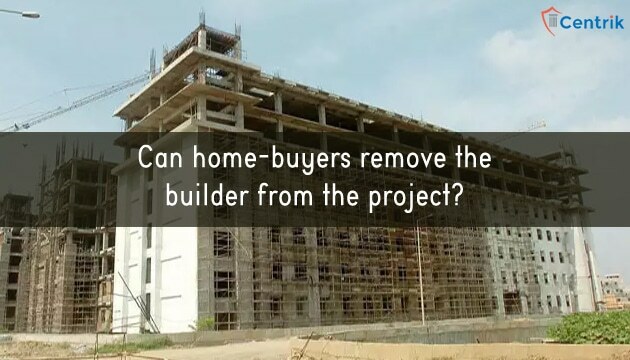 As per the RERA provisions, if there is any delay in the project or the builder is unable to provide possession as per the terms and conditions of the Builder-Buyer agreement then a home-buyer has a right to claim a refund along with the interest and in such cases where the home-buyers want to keep the possession then still he is entitled for the interest for the delayed period. After the introduction of the RERA Act,2016, there have been numerous judgement, wherein refund has been granted. Here one question arises that the Does granting refund provides the benefit to the home-buyers at large; because all the home-buyers once had a dream of having their own house. To resolve such issue and extending the benefit to the maximum home-buyers, the MAHARERA Authority is working on the Standard Operating Procedure (SOP) which will allow the home-buyers to remove the developer from the project, the home-buyers hereafter may appoint a new developer with the consent of the RERA Authorities. As of now, RERA has a right to revoke the RERA registration of the Builder but it does not serve the purpose of delivering the flats to the home-buyers. Even granting the refund to the few home-buyers does not pressurise or push the builder to provide the delivery on time as there is already financial crisis in the Real Estate market; it means the interest at large still nowhere being served. There have been few instances where the project is stalled and the association of the allottees have been handed over the project to complete the remaining construction of the project; but still there are no provisions and procedures wherein home-buyers can directly remove the Builder from the project and appoint some other Builder to complete the remaining construction. At last, we can infer that, this step of MAHARERA Authority will be a milestone as it is going to resolve the problems of the home-buyers at large.